Is it Raven? Is it Starfire? No it's Wanda Django Maximoff...the Scarlet Witch. 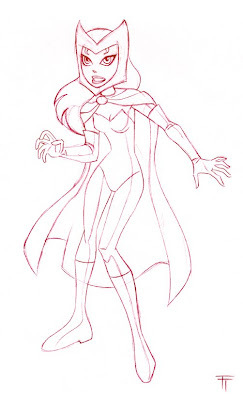 The Scarlet Witch is the daughter of master villain Magneto, the twin sister of Quicksilver and half-sister of Polaris. Created by Stan Lee and Jack Kirby. I would like to dedicate this one to my pal Glen.